Buying full price apps every week can add up and really hit your wallet. Of course you still want to keep your iPad and iPhone chock full of the latest and greatest content, so we’re bringing you a quick roundup of some apps that have seen price drops this week. 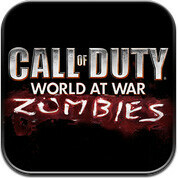 First off, Call of Duty: World at War: Zombies for iPhone or iPad has just been discounted $3 making it just $1.99 for either version. For Earth Day, Peterson Birds of North America is just 99¢. This mobile bird guide won the 2011 Best Outdoors App Ever Award and usually retails for $14.99! Midway Arcade has just been updated to add iCADE support. It comes with 10 games: Spy Hunter, Rampage, Joust, RootBeer Tapper, Defender and Arch Rivals, Air Hockey, Arcade Basketball, Pool, and Roll Ball. Right now it is 50% off making it just 99¢. Also in the 50% off bin are SpellTower and Age Of Winds 2. Both are just 99¢ and are compatible with iPhone, iPod touch, and iPad. JAZZ: Trump’s journey is 60% off its usually $2.99 knocking it into the always affordable 99¢ category. Finally, the story-driven action-adventure Crow sees a $2 discount down to $2.99.